Agent Jared Francom was shot and killed while serving a drug-related search warrant at an Ogden residence on Jackson Avenue around 8:40 pm. As members of the task force approached the home the suspect opened fire on them. After firing at the officers, the suspect fled to a shed near the home and barricaded himself inside. He was shot and wounded by other responding officers before being taken into custody. Three other members of the Ogden Police Department, a member of the Weber County Sheriff's Office, and a member of the Roy Police Department were also wounded in the shooting. Agent Francom suffered a fatal wound in the shooting and was pronounced dead shortly after midnight. The subject was subsequently charged with aggravated murder. On May 24th, 2013, he committed suicide by hanging himself in his jail cell. 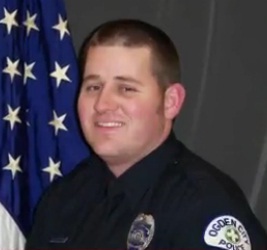 Agent Francom had served with the Ogden Police Department for seven years and was assigned to the Weber-Morgan Narcotics Strike Force. He is survived by his wife and two young children. Coming up on 7 years. Miss you each day.